Houston is in full bloom right now and Eastern Redbud trees are flowering all over the city. I look forward to this time of year and these purple flowering trees are only in bloom for a month or two before the temperatures soar and the flowers turn to green leaves. I couldn't resist photographing for the blog. One of my favorite parts of blogging is location scouting. It's funny, these were not taken in the most glamorous of locations. However, with the blooming trees as a backdrop, and a few clever angles a great location was produced! Lately I've been into all things neutral. Although I love, love, love to wear color... with all of the color around every corner, a part of me has been drawn near to neutrals. The crisp whites, soft tans, camels and creams fill my current palette. 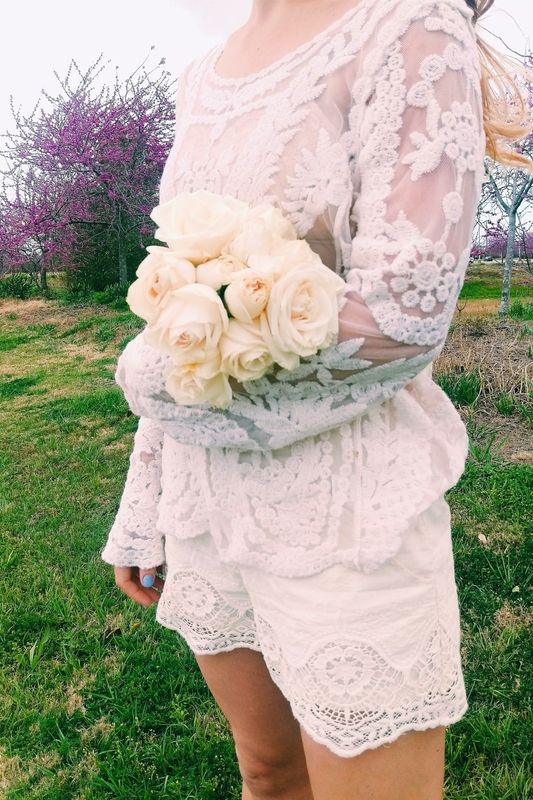 I love this simple combo of cream lace shorts and a bell sleeved top. I wore this top previously here and here, but am always looking for new ways to switch up things I have in my closet. Speaking of whites, I really love this romper and this one. I love both of these items for Spring. These shorts were worn a few weeks back with a pair of casual flats and sweater, but I added sandals with a block heel for today's look. This is perfect for Easter weekend to go to dinner, brunch or simply switch out my shoes and just lounge. It's super comfy and as long as I don't spill anything, it's pretty easy going. As far as this weekend is concerned, I'm planning on finishing some new DIY projects. Last night I worked on these new lace up ballet flats, and a really cute off the shoulder dress. What are your plans for the weekend?